A recent photograph clearly shows two important biological aids for house dust mites. One is the sensing antennae located on the mite's body and two the gripping suckers at the end of each leg. 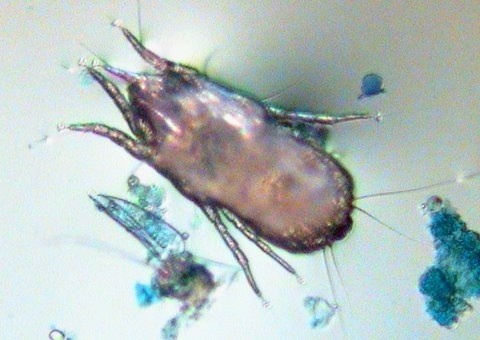 House dust mites (HDM) evolved over 60 million years ago not with sight, but with an exquisite sense of smell and multiple signalling antennae located on their body to pick up vibrations. By combining a sense of smell for food or for hormone secretions (sexual or alarm) and signalling vibrations the mite has proven to be a survivor. Combine this with its amazing ability to recycle hard-to-digest food using active digestive enzymes in its droppings, its no wonder that the mite has survived the catastrophic events the earth has experienced. There is only one problem. The mite loves living in human homes and its presence can make some people ill.